alaTest has collected and analyzed 12 reviews of Alcatel OneTouch Pop 8. The average rating for this product is 4.0/5, compared to an average rating of 4.3/5 for other products in the same category for all reviews. Reviewers are impressed by the reliability and price. Many are negative about the usability. We analyzed user and expert ratings, product age and more factors. 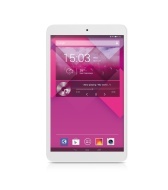 Compared to other products in the same category the Alcatel OneTouch Pop 8 is awarded an overall alaScore™ of 85/100 = Very good quality. alaTest has collected and analyzed 1 user review of Alcatel OneTouch Pop 8 from Amazon.com. The average user rating for this product is 4.0/5, compared to an average user rating of 4.1/5 for other products in the same category on Amazon.com. The uses for a 3G-enabled tablet range from keeping families connected and entertained on trips, aiding cab drivers in navigation or communication, and a student's companion for note taking and keeping in touch with family or friends.